Around Mom's Kitchen Table: Make Gluten-Free Pasta at Home! Make Gluten-Free Pasta at Home! My daughter has developed a gluten sensitivity, so I have been spending time looking for recipes that she can use to satisfy her cravings for foods she has traditionally eaten. These gluten-free pasta recipes will let her enjoy the pasta she loves without spending time in the ER recuperating from a reaction. The search was made a little more difficult since she also has a severe nightshade allergy, which means potato starch can't be used in the recipe, either. I did learn in my reading that guar gum or a combination of chia and flax seeds can be used as substitutes for potato starch, so some of the following recipes may have potato starch listed. Just be sure to substitute if you are nightshade sensitive. There is a great article on The Art of Gluten-Free Baking on substitutes for gluten. Many of these substitutes are good for people with nightshade allergies, too. Sometimes, it just has to be pasta! Easy gluten-free pasta is delicious. According to one review, let the dough sit for about an hour before rolling it out. 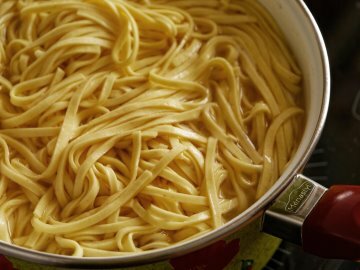 Gluten-Free Fresh Pasta This imaginative cook uses a combination of chia seeds and flax seeds instead of guar gum. Do you have someone in your family who has a gluten sensitivity?